For nearly 50 years, transit service in Denver has been dictated by RTD, a regional agency where the city plays second fiddle to its suburbs. That could finally change with the Denveright initiative — which aims to rethink bus and rail service with the city proper as the focal point. Mayor Michael Hancock has said that Denver residents will play a major role in developing the city’s blueprint for better transit over the next 18 months. Two local organizations want to ensure the public can make informed, effective contributions to the plan, so they’ve started a book club for people committed to improving Denver transit. 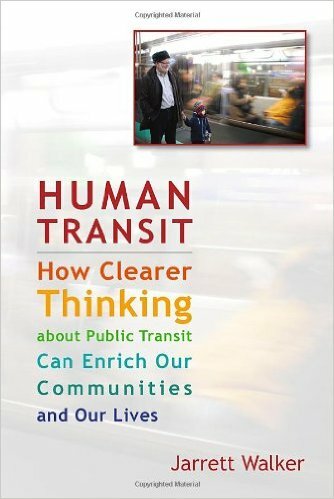 The Transit Alliance and the Inter-Neighborhood Cooperation‘s Transportation Committee invite you to the first meeting of the book club Wednesday night from 4:30 to 6 p.m. at Brik on York, 2223 E. Colfax Ave.
Walker’s book is all about creating what he calls “liberating” transit — systems that people can use to get wherever they want to go in their city, without worrying about things like whether the bus will still be running when they head home for the day. Check out Walker’s blog for the full spectrum of his expertise. Walker’s book is a perfect manual for civically engaged residents to use during the Denveright process, says Jamie Perkins, Transit Alliance’s program manager. “He writes a lot about designing a system around people, around people’s behavior, and what people need,” Perkins said. How can Denver transit help liberate people from being tethered to their cars? Will buses and trains continue to funnel people downtown, or will the transit network evolve to connect people to a wider variety of destinations? These are some questions the Denveright process will have to address, and “Human Transit” can help. You don’t have to read the book before the meeting tomorrow night to participate. Transit Alliance and the INC Transportation Committee will have copies available to lend. There are only so many, though, so email jperkins@transitalliance.org if you’re interested in borrowing one. After tomorrow, two more meetings are on tap for October 4 and October 18. If the club proves popular, more sessions may follow. RTD doesn’t dictate. They have an active Board of Directors that serves at the pleasure of metro area residents and voters. Downtown Denver has always been the biggest beneficiary of transit even though the lion’s share of funding comes from outside of the city. I do enjoy Jarrett Walker. While I haven’t read his book I have read a fair amount. With respect to his recent involvement with Austin, he recommended that they utilize BRT. Pretty exciting, I guess. AFAIK, Denver/Denveright has no interest in setting up a separate transit agency. They are interested in looking at “Buy-ins” with RTD which is something Boulder has done. The thing is, RTD’s focus has historically been and will continue to be on serving suburban and urban commuters: those going to and from work. Plus, with FasTracks still being built out, RTD will not tackle urban non-commuting transit, as they stated (although not in so many words) that they would could not take the lead with the Colfax transit. While it may be true that Downtown Denver is the biggest beneficiary of transit, the city and residents of Denver has the greatest under-tapped market for transit compared to the rest of the metro area. Unfortunately, since the RTD’s Board of Directors serves “at the pleasure of metro area residents”, anything that comes across as Denver-centered gets pushback as in the case of funding the Union Station transit center. Denver needs to take the lead, work with RTD to fund the necessary improvements and do what is best for the citizens of the Denver. Especially at this time, what the City of Denver would design for itself would be very different from what RTD has done.